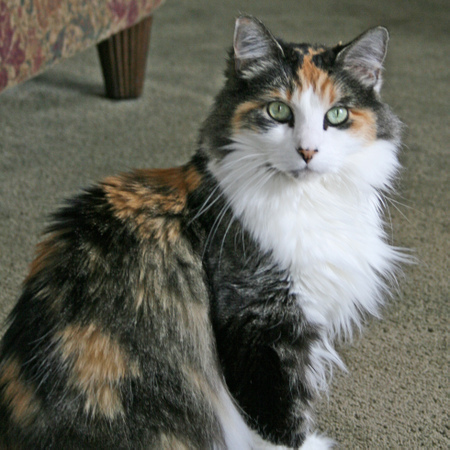 My fluffy, long-haired, calico, kitty is now an exotic, sleek, velvety, lioness, princess, cat. That's what we're telling her anyway. The white hair puffs on my dark olive colored carpet finally got to me. So did the occassional hair ball that she would cough up...Ewww! I didn't want anyone here at home to have to deal with such yuckies while I was in China. Before I left, I took her in for a hair cut. Here is the result. At first, I though she looked comical. Now I kinda like it. I think she looks very avante-garde. She feels just like velvet. I'm sure that some ancient Egyptian culture would worship her as queen of the universe. To us, she is still just our calico cat, Tinkerbell, who is loved a whole bunch. Go kitty! It should be noted that kitty is not real impressed with her new 'do'. She fakes a shiver every time I look at her. Since her makeover, she has not slept on the end of my bed at night, like she usually does, nor has she graced me with her presence in my sewing room. Maybe my absence will soften up her heart? Umm...at least it will grow back! Tooo funny! You could have left her a *little* fur! I hope you are having a great time in China! OhMyGosh! That's hysterical! 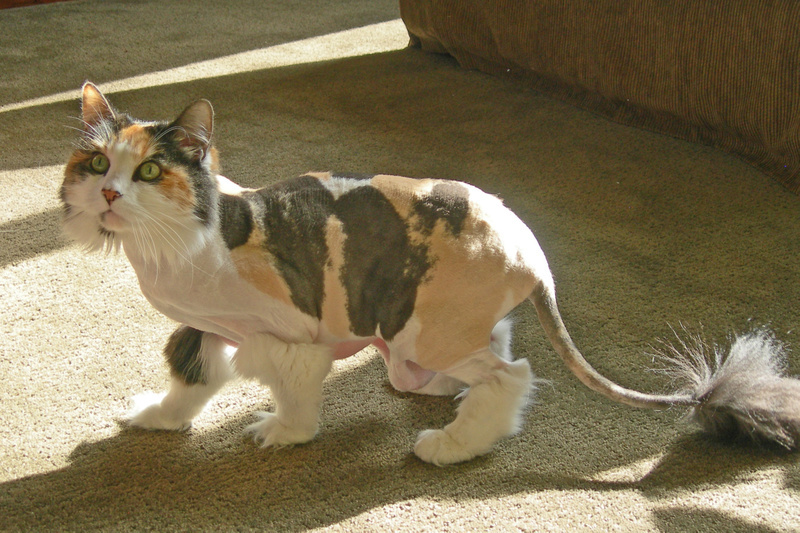 I didn't know you could do that to a cat!!! Poor little kitty...haha. Hope your trip is fabulous! She is so cute and that should definately help with the hairballs! My cats are short hairs, I wish they were long so we could shave them! This is too funny. 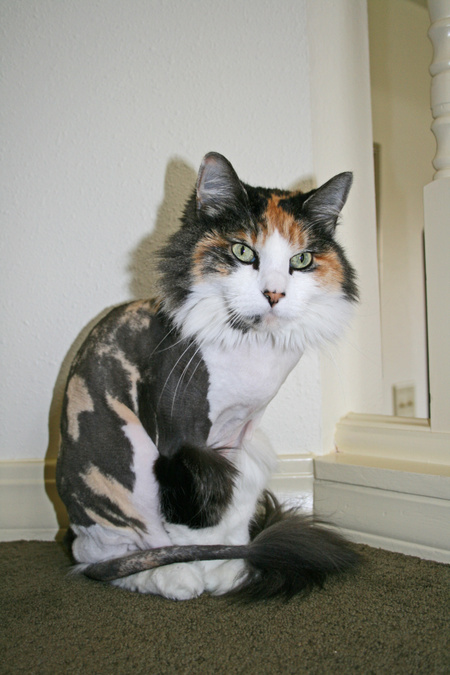 I have had my long hair cat shaved twice now (the hair just gets to be too much, poor thing!). I thought he would hate it, but I think he actually really likes it when his hair is short! He prances around more. I think he's happy because he doesn't have as much hair to lick and so he has more time to terrorize the other cat. I did this once to my cats and all of our friends kept asking if our cats were sick! Loved the no hair on everything though! Yeah, I don't want to sound rude or mean but no wonder she won't come in with you to bed anymore or do anything else - you have scared her for life - she is a beautiful cat and didn't deserve the shaving - if you are that lazy and grossed out by cleaning up some hair balls once in a while you shouldn't have a cat!!!!! and anyone who is willing to pet sit for you shouldn't be grossed out either!!!! !